New Zealand-born director Martin Campbell is perhaps best known today as the man who reinvented the James Bond franchise twice, introducing Pierce Brosnan in GoldenEye (1995), and Daniel Craig in Casino Royale (2006) just over a decade later. However, long before his work on the Bond films, Campbell had a rich career that spread across many genres, in film and television, both in the United Kingdom and in Hollywood. His crowning achievement may be the 1985 BBC miniseries Edge of Darkness , a tour-de-force conspiracy thriller that reflected the grim reality of British politics in the 1980s. Campbell has recently directed a big-screen remake of the series starring Mel Gibson, and I hope it will make more people interested enough in checking the original version. The director's earlier career contains some other gems waiting to be discovered, notably the 1991 HBO television movie Cast a Deadly Spell . Though one of Campbell's lesser known works, the movie was ahead of its time in many respects, featuring stylistic and narrative elements that would become standard in many future genre productions. The opening titles of Cast a Deadly Spell set the tone for the rest of the film: "Los Angeles, 1948. Everybody used magic." The film takes place in an alternate late '40s America where magic and magical creatures are everywhere, and as law enforcement is getting weaker, society is slowly falling apart. 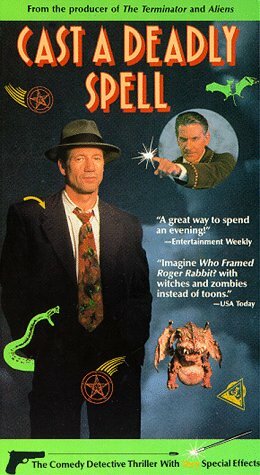 The protagonist, Philip Lovecraft (Fred Ward), is a former police officer who works as a private detective, stuck at the bottom of his professional food chain mostly because he refuses to use magic, not willing to allow anyone to "have a mortgage on his soul." Just as it seems that Lovecraft has hit bottom, not being able to even pay his own rent, he is hired by millionaire Amos Hackshaw (David Warner) to locate a mysterious book stolen from him—the Necronomicon . Lovecraft's investigation soon gets him in trouble with his former police partner and current big-time gangster Harry Bordon (Clancy Brown) and his old flame Connie Stone (Julianne Moore, shortly before becoming a Hollywood star). While Lovecraft is named after the creator of the Cthulhu Mythos, his portrayal by Ward as a strong and confident hero has very little in common with the fragile, sickly horror author. In a similar manner, while the script makes many references to elements from the Mythos (right down to a club called "The Dunwich Room"), they appear in a new context. In Cast a Deadly Spell , everyone uses magic without any apparent risk to their sanity. Upon a closer inspection, however, it would be more accurate to describe the world of the film as one where everyone went insane, driven mad by power, with the protagonist's insistence on retaining his own sanity making him an outcast. In this respect, Joseph Dougherty's script cleverly links the Cthulhu Mythos's sense of dread with the film noir genre's atmosphere of social collapse. But while the thematic link between the two genres works very well, the narrative link between them is less successful. The supernatural elements sometimes feel like mere props in what could have otherwise been a routine search-for-a-McGuffin plot set in the real world. It seems that Dougherty didn't work very hard to come up with new twists on the old clichés: the down on his luck detective, the murderous gangster, the beautiful dame—all fill their roles in as expected, from start to finish. The script also attempts to give the dialogue a Chandler-like flavor, but there are too many long conversations that feel artificial and dull. Unlike the script, however, Campbell's direction does a magnificent job at fusing the two genres into an atmospheric urban fantasy setting. Like most successful fantasy world-building exercises on the screen, the world of Cast a Deadly Spell is made fantastic through the small details of everyday life: naughty children cast curses, gremlins brought by World War 2 soldiers wreak havoc on car engines, vampires and werewolves await their booking at the local police station, and zombies are employed as construction workers and henchmen. The film was made before the takeover of the digital effects industry, so some of the creatures seen in the film have a Jim Henson-style furry animal feeling to them, but the dark mood that Campbell borrows from the film noir genre prevents them from functioning as unintentional comic relief. The grim streets that the hero crosses through his investigation, shot in dark colors and accompanied by an occasional well-choreographed fight, keep the tone serious, as do the actors—Warner and Brown, who made a career out of playing villains, are on top form here, and their cool attitude lends their roles an eerie quality. One thing that made Edge of Darkness a classic in the conspiracy thriller genre was a clever combination of two major political concerns: the loss of individual freedom and the environmental crisis. In a way, Campbell also brought this combination to Cast a Deadly Spell : in a world where everyone uses magic, people live under the constant threat of being marked for death by a nasty curse or a monster, and the constant use of magic comes at a price for the whole world—the ever-present rainstorms are a result of the constant abuse that the natural order takes from human beings. I don't know if anyone at Ten-Thirteen Productions or Mutant Enemy has seen Cast a Deadly Spell , but many elements in the leading supernatural dramas of the 1990s feel like they have been influenced by the film. The X-Files (whose general paranoid mood also owes a lot to Edge of Darkness ) also introduced monsters and occult into a modern setting, framed by a detective story about heroes who are considered outcasts by the establishment. Buffy the Vampire Slayer went further in adopting the film's self-aware nature, with a heroine who fights monsters while making witty remarks, while Angel even seems to borrow the entire monster-noir concept, along with the Los Angeles setting, from Cast a Deadly Spell . Witch Hunt , a loose sequel to Cast a Deadly Spell , was broadcast in 1994. Set during the Red Scare of the 1950s, with Dennis Hooper replacing Ward as Lovecraft and Paul Schader directing, it fails to match the original in either setting or story. The crew behind Cast a Deadly Spell had moved on to other things, though disappointingly, mostly outside of the genre. A notable exception here is production designer Jon Bunker, who later worked on the excellent British vampire drama Ultraviolet (1998)—which, much like Cast a Deadly Spell , gave a fresh modern spin to an old myth, albeit in a far more realistic tone. Cast a Deadly Spell was released on home video in 2001, and although the tapes are now out of print, used copies can be found online. The film is yet to be released on DVD, and I certainly hope it will be—it deserves a wider recognition as one of Campbell's early works, and for pioneering many elements familiar in today's genre television. Raz Greenberg is currently working on his PhD, researching animation as text at the Hebrew University in Jerusalem. He has contributed science fiction and fantasy-related reviews to a variety of Hebrew and English publications, published stories in the space opera magazine Ray Gun Revival and the British comics magazine FutureQuake , and translated books to Hebrew, notably John Scalzi's Old Man's War . Raz Greenberg divides his time between working as a content editor, lecturing on comics and animation in several academic institutes, writing reviews and articles for a variety of publications (Strange Horizons, Tablet Magazine, and All the Anime, among others), and writing fiction. He muses about overlooked genre classics at the Space Oddities Facebook page. A season 2 episode of Angel (name withheld for cross-spoiling potential) uses the same punchline as Cast a Deadly Spell, but it's not final proof of influence as it's the sort of plot twist that people could easily duplicate independently. This is one of my favourite movies. As a HPL fanatic, I loved the treatment of the Mythos. The film even inspired some of my own writing. A forgotten masterpiece. Also, I did not know the Campbell also directed GoldenEye and Casino Royal. That must be why those were some of the best Bond films in many years. Thanks so much for the plot synopsis. I've been especially drawn to the character of Vivian, but never caught her last name - it was Dart or Dark. No credit for her - early version of what we would now call CGI?